This post was sponsored by Shindigz. All ideas and opinions are my own. 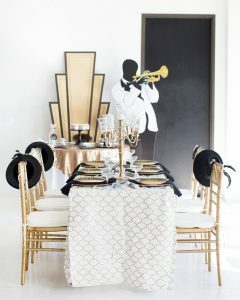 One of my favorite New Year’s Eve party themes of all time is the Roaring 20s. This era was full of decadence, glitz and glam, making it perfect for an epic NYE celebration. 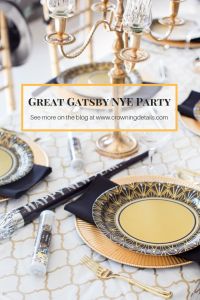 We are sharing 8 must have items for your Roaring 20s New Year’s Eve party below. The focal point of our snack and beverage display was the over-sized art déco décor. We displayed an art deco standee on top of our 48” round table; it was truly a statement piece. This unique standee can also be used as a stand alone decor item for your new year’s eve party. 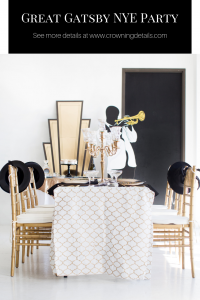 Then, since this was certainly a party, we added the trumpet player standee to evoke a lively party mood. We also incorporated art deco references in our selections of paper plates, paper napkins and personalized stickers. A 1920s event wouldn’t be complete without coupe champagne glasses; they are iconic to this era. Our guests dined with vintage coupe glasses during dinner, but we opted for the disposable version for the remainder of the evening. Gold made an appearance in several places for our New Year’s Eve party! 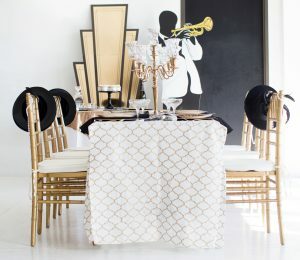 We selected this subtle gold patterned table cover (which was disposable and super convenient) for our seated tables, and a gold sequin overlay for our snack and beverage display. 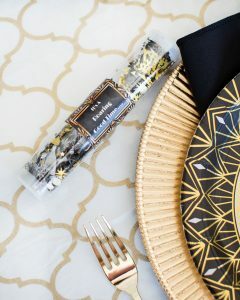 Gold charger plates added contrast to our art deco inspired paper plates. 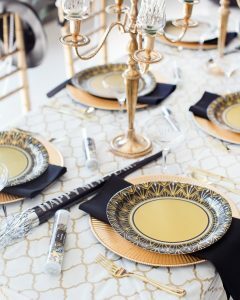 Then, we selected gold flatware, gold rimmed beverage glasses and gold foil paper napkins for some added sparkle. 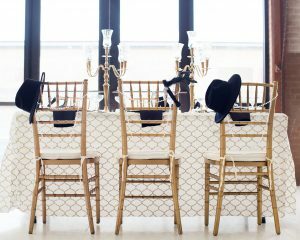 We draped the backs of our gold Chivari chairs with 60″ strands of pearls. This added a subtle nod to the time ear, and a fun party detail. Incorporating props that double as party decorations are a win-win. 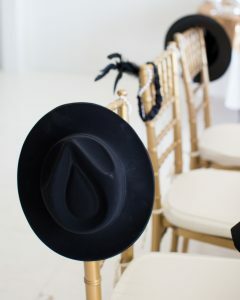 We draped the chair backs with alternating black flapper headbands and black fedora hats for guests to enjoy during the Roaring 20s New Year’s Eve party. The 1920s marked an important era of prohibition, so we couldn’t resist adding this iconic reference to our bar area. 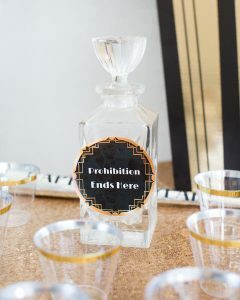 This fun “Prohibition Ends Here” sticker was added to an alcohol decanter. Stickers are a great way to add personalization to any party theme! You can’t throw a NYE party without party horns!! We selected these over-sized NYE party blowers in black, gold and silver to encourage guests to ring in the new year at the stroke of midnight. We displayed them on both or seated tables and the snack and beverage area. Confetti always seems to complete an event, especially a New Year’s Eve party! We filled plastic tubes with confetti, then added personalized “It’s a Roaring Good Time” art deco stickers. These were a hit among our guests! 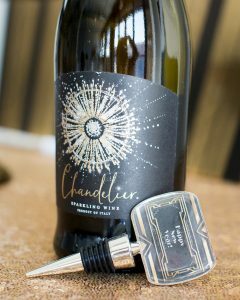 Include these 8 must have items in your Roaring 20s New Year’s Eve party for an epic event! Happy New Year! 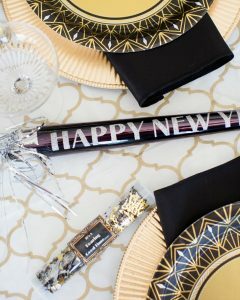 Throw a NYE Party on the Fly!